While the home of this year’s NCAA Division III Baseball Tournament has changed, the quality of baseball to be played on college campuses has not. Each of the schools listed below unquestionably has the talent for a historic season and the ability take home the D-III title this May. The teams are indeed ranked from one to twenty-five, but the difference between each position is slight. It should shock no one if any of these clubs, as well as a few others who just missed the list, find themselves crashing into the infield in Cedar Rapids once the final out is made. Following are the top NCAA Division III teams headed into the 2019 season. Rk. School ST Record ’18 Rk. Last year the Profs finished the season with a 35-11 record and took home the New Jersey Athletic Conference Championship title by taking two of three from Ramapo College. With the win Rowan not only received an automatic bid to the postseason, but they also were awarded the top seed in the NCAA Mid-Atlantic Regional. However, despite being the favorite, they were unable to advance any further in the postseason as they went 2-2 in the Mid-Atlantic Regional to have their season come to an end. Nevertheless, with plenty of power bats and able arms returning to the roster, the Profs are a favorite on the short-short list of teams favorited to advance to the D-II College World Series and bring home the national title. Anthony Harrold and Dillon Mendel yield the biggest bats back on campus. Harrold hit .373 with 14 doubles, two triples and five home runs to finish tops on the team in slugging percentage. Mendel was equally formidable, batting .376 with 15 doubles, six triples (which tied the single season record) and a pair of home runs. Other players who will contribute greatly at the plate include second baseman Alex Kokos, who hit .325 and compiled a .971 fielding percentage at second base, and centerfielder Dan Shane, who amassed a .432 on-base percentage thanks to finishing in the top 10 nationally in walks. Shane put the free passes to good use as he was 26-for-32 on stolen base attempts. Joining the team will be Matt Woods who stated 25 games at St. Johns where he batted .261 after being an NJCAA All-American in 2017. Mitch Walker will be an additional former D-I player on the roster after redshirting at UNC Central last spring. Three of four Rowan starting pitchers return who combined for a 22-4 record and helped the club finish the season with a fourth in the nation team 2.74 ERA. Danny Serrenino threw 79 innings last season, striking out 89 and ended the year with a teeny-tiny 1.25 ERA. He also impressively threw three complete games, two of which were shutouts, and held opponents to a minuscule .130 batting average. Andrew DiPizaza’s numbers were nearly equally as impressive. He went 7-1 with a 1.49 ERA in 10 starts, amassing 78 strikeouts in 60 1/3 innings. He had opposition to a .184 batting average and tied the school record with 15 strikeouts versus Ripon College in a seven-inning masterpiece. Drew Ryback and Justin Smith will also be welcomed back to the staff. Ryback had eight starts and earned a 2.83 ERA while Smith appeared in 13 games in a mixed role, striking out 27 in 31 2/3 with three saves. College of Wooster head coach Tim Pettorini is the active leader in D-III coaching wins with 1,213 (1,213-446-6) in 38 seasons, all with the Fighting Scots. He announced mid-January that he will retire as head coach of the Scots’ baseball program at the conconclusion of the 2019 season. While at the helm Wooster has consistently been within outs away from claiming a national championship, but like Wile E. Coyote chasing the Road Runner, has perpetually fell short of reaching their goal. Ten years ago the Scots were twice a win away from taking home the title, but the St. Thomas Tommies won one game by taking the lead in the ninth inning and won the other in extra innings. Pettonini’s club will be going all out to make sure they have everything on the field as they try to send their coach out a winner. Wooster returns six starting position players for Pettorini’s swan song season, with Dan Harwood and Garrett Crum offensively spearheading the group. Harwood hit .383 with 14 home runs and his 72 RBI were just one behind the D-III leader. Crum batted .365 and racked up 13 doubles as well as nine home runs. They’ll be rejoined in the lineup by Jake Stuursma, who batted .338, and Chandler Dippman, who batted. 317. As the team’s everyday second and third basemen, the two played a pivot role defensively for Wooster who led D-III with a dandy .978 fielding percentage. On the mound, the Scots return two pitchers who started a dozen games. One of those two is the aforementioned Chandler Dippman. Dippman threw 69 2/3 innings, three compete games and earned a 2.71 ERA when he wasn’t playing third base. The other pitcher with extensive starting experience is Brian Murray. He threw 67 1/3 innings, only allowed 57 hits and had 3.61 ERA. While neither of the pair had overpowering stuff on the mound, both were more than capable at getting outs and making sure Wooster earned their wins. Andrew Hill and Evan Faxon both appeared in 17 games last season with three starts each as freshman. They’ll be looking to take on an expanded role this season, especially with the absence of Nanak Saran, last year’s ace, having graduated after the season. Colin Springer, a freshman from San Diego, could make an impact this season out of the bullpen. Last season, the Beacons claimed their second straight Little East Conference title as well as made back-to-back appearances in a regional title game. Their 37-10 record included 11 conference wins (which matched their program record) and they were in the top 10 of the rankings the entire season, even spending a pair of weeks in the top spot in the middle of the year. In the extended postseason the Beacons advanced deep in the Harwich Regional, but were unable to get past the Lakers of SUNY Oswego who were absolutely torrid the second half of the season. The leading batsman back in the lineup is Ryan McCormick who transitioned from being a pinch-hitting specialist and role player into the Beacons’ starting catcher. While swinging in the middle of the lineup he finished second on the team in batting average at .354 and doubles with 15. Eddie Riley had a .402 on-base percentage and provided occasional pop and brilliant defense at third base. Kyle Boudrias earned All-Conference honors for the third straight season as he finished the year with a .344 average and nine doubles. Another important defensive component back is shortstop Charlie Huegi who had a hand in turning 28 double plays and swiped 17 bases. Solidifying the defense will be infielder Ryan Colins, a transfer from Northern Essex CC, who earned All American and Golden Glove honors at shortstop. Despite being solid on offense and defense, what truly makes the Beacons a team to beat is their pitching staff as their entire rotation is once again available in 2019. Fernando Burgos established a new program record for wins in a season (he went 9-1) and career wins (18) as he recorded the second-best ERA and opponent batting average amongst starters on the team at 3.08 and .263. The pitcher who bested him in those two categories was JT Morin who returned from an early season-ending injury in 2017 to lead the staff. He threw 57 2/3 innings and struck out 66 while only allowing 27 hits for a near unfathomable .141 opponent batting average. His ERA was 2.50 and he twice earned LEC Pitcher of the Week honors. Also back is Bobby Tramondozzi who set the program record for single season and career saves with nine and 16, respectively. He allowed one or fewer runs in 18 of his appearances, didn’t allow even a single run 15 times and finished with a 3.06 ERA. Matt Demma, who struck out 32 in 32 1/2 innings at St. Joseph’s College, and Kelly Kileen, a transfer from Franklin Pierce, will round out the staff. The Yellow Jackets are coming off their most successful season in program history as head coach Ray Hedrick helped his Jackets post an overall mark of 38-9-1. The 39 wins established a school record for victories in a season, which included an impressive 17-3 mark in Old Dominion Athletic Conference contests. With the wins they captured their first ODAC regular season crown since 1987. Their winning ways didn’t stop in conference play as R-MC swept their way to their first regional title and advanced to the D-III CWS. In Wisconsin the Yellow Jackets lost their opening game, but won their next three before being eliminated by eventual national champion UT-Tyler. While surpassing those results in 2019 won’t be easy, it is a challenge worth undertaking as much of last year’s team will be back on the diamond in 2019. Jeff Butler started all 48 games at second base last season and earned All-ODAC First Team honors and was named to the VaSID All-State Second Team after finishing the year with a .347 batting average. He also was credited with nine doubles and eight home runs on his stat line as well as a dozen stolen bases. Rejoining him up the middle of the infield is seasoned soft-handed shortstop Zach Evans and catcher Reece Yeargain. Yeargain batted .313 and was fourth in the ODAC with eight home runs. The Jackets have a bona fide ace in Nick Roth who went 11-1 in 15 starts with a 3.13 ERA. The wins placed him fourth in the nation and set a new school record. In his 89 innings on the mound, he walked only eight while striking out 78 for a ninth-in-the-nation strikeout-to-walk ratio of 9.75. Also returning are Michael Zubovich and Matthew Nickles. Each started seven games and had 3.66 and 3.28 ERAs, respectively. The depth after those three and senior Tommy Barron, who appeared in 17 games, gets a little sketchy, and another pair of arms, especially a closer, is needed. If they do develop R-MC will be near unstoppable. The Huskies had another successful season in 2018, reaching the NCAA New York Regional championship round for the second straight season. However, despite winning games against Amherst, Salisbury and Cortland, USM couldn’t get by upstart Swarthmore and had their season come to an unsatisfying close. With a talented roster at the plate and on the mound the Huskies will be in a good position to reach the D-III World Series for the first time since their back-to-back appearances in 2013 and 2014. Jake Dexter is a two-way player who excels at both positions. He is the starting second baseman for the Huskies, where he batted .382 with 17 extra-base hits. He also serves as the team’s closer and has earned 26 saves the past two seasons. Last year he made 25 appearances on the mound and struck out 47 batters in 44 1/3 with only 11 walks. While he lacks Dexter’s pitching prowess, Devin Warren rivaled him in hitting ability. He batted a team-high .369 with 15 doubles, two triples and two home runs. Also rejoining them in the Husky lineup will be shortstop Andrew Olszak, who batted .307, and Dylan Hapworth, who finished the year at .313 with 11 doubles and a team-leading eight home runs. USM’s top three starters from last season, Ben Lambertt, Gage Feeney and Dalton Rice, will all be back on the Huskies pitching staff. Lambert started six games, appearing in another dozen out of the bullpen. In that dual role he had a 2.82 ERA with 60 Ks in 51 innings. Rice started nine games and struck out 63 in 48 2/3 and Feenry started an even 10 games, throwing 60 2/3 frames with a 3.41 ERA. Noah Bonsant could see important innings as a freshman. The Redhawks captured the Allegheny Mountain Collegiate Conference regular season and tournament titles, only losing two of 18 games to conference foes. Nevertheless, they didn’t fare as well in the Midwest Regional. After winning their opener against Ithaca, they dropped two straight, getting upended by host Adrian and Wabash. This season the Redhawks return a veteran heavy group hungry to accomplish more. It’s a squad that head coach Chase Rowe believes is the most talented and deep team he’s piloted in his 12 seasons at La Roche. Jon Spina, Joe Professori and Jay Novack each started 45 games and batted .412, .378 and .359 respectively. Spina topped the team in total bases with 102 thanks in large part to his six triples. Professori had 11 doubles and six triples and Novak shared the team lead in home runs despite only being a freshman. Big, big things are expected from Troy Kifer and Brandon Nania who transferred from D-II schools Fairmont State and Winston Salem State. Rowe believes each of them could earn All American honors at the end of the season. He wouldn’t be surprised to see shortstop Austin Hoffman earn some hardware for his efforts either after batting .318 last season. The team has a wealth of potential starters with up to 10 legitimate arms looking to throw the first pitch in games. One player who’ll undoubtedly be making a number of initial appearances is Tre Thomas. Last season Thomas went 9-1 with a 1.47 ERA and 70 strikeouts in 61 1/3 innings. He topped the AMCC Conference in wins and ERA, which also positioned him in the top 20 nationally in both categories. Jake Seymor excelled in a relief role, appearing in 22 games out of the bullpen. He threw 41 innings with 32 strikeouts, 12 walks and a 2.20 ERA. As with the offense, transfers could factor in immediately. Dustin Lander from D-I Charleston Southern, Tristan Tinney from Seton Hill and Travis Holman, formerly of IUP, will push each other and the established arms for prominent roles on the staff. The Bulldogs’ impressive 2018 season win total of 42 was the third-most in school history, thanks in part to 11 wins during a deep postseason run that ended with them being one of the last two teams standing. 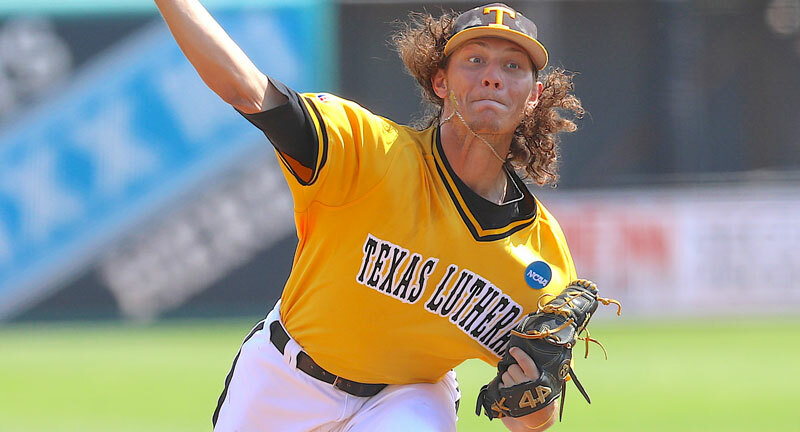 TLU swept through both the Southern Collegiate Athletic Conference and NCAA Regionals to earn their way to the D-III CWS for the first time in school history. While in Appleton, the Bulldogs shut out Wooster, edged Swarthmore in extra innings and outlasted CU-Chicago in three hotly contested games to advance to the finals. In the final series they were bested by in-state rival Texas-Tyler. This season the ‘Dogs will be looking to take that last step and return home home to south Texas as champions. Two top hitters from last season return, including double-digit homer outfielder Tyler Cauley, who led the nation in total bases. Last season he finished with a .371/.438/.693 slash line and led the team with 66 RBI. Third baseman Thomas Varner started every game last season and hit .352 with 16 doubles while topping the team with 21 stolen bases. Also returning is Gold Glove catcher Spencer Brandt who was errorless the entire season and impressively threw out 18 of 27 attempted basestealers. Another welcome returner is Chad Curtis, who started every game and was the team’s first baseman. He hit .266 in his first year coming from Midland College, where he was All-South Plains as a designated hitter. Nathan Malinovsky is one of the top pitchers in D-III and finished last season with a 12-2 record and struck out 108 batters in 110 2/3 innings on the mound. Those numbers included the before-mentioned shut out of Wooster at the D-III CWS, holding opponents to a .188 average with six complete games. In addition to Malinovsky, Landon Weatherly will also be back as a starter. He started six games, earning a 2.92 ERA and stuck out 35 in 40 innings. The bulk of the bullpen returns with Dylan Murrell and Drew Waller back who split the closer role last year and totaled nine saves. They had 2.08 and 3.38 ERAs, respectively, and will keep opponents on their heels until the last out. Riley Backs, a freshman out of Houston, could also see significant innings his first year on campus. After winning the Old Dominion Athletic Conference regular season title the previous four years, Shenandoah looked like a lock to make it five in a row, but instead had to settle for a fourth-place finish after a few balls didn’t bounce their way. Nevertheless, SU rallied their bats and arms and won their second-ever Old Dominion Athletic Conference tournament championship by sweeping their way to wins over Randolph-Macon, Virginia Wesleyan and Roanoke. In regional action the Hornets won their opening game against Marietta, but suffered losses in the next two, punctuated by a late collapse when they were winning 5-1, to end their season. While their pitching staff took some major hits in the offseason, the offense is largely intact and the Hornets have the moxie be a top 10 team for the duration of the season. Four batters who started at least 43 games and batted a minimum of .342 return to everyday lineup. Keegan Woolford batted .347, topped the team with 10 homers and led the ODAC with 66 RBI. Shortstop Robert Marcelle hit .367 and paced SU with 21 stolen bases. Luke Nussman is a sturdy first baseman who is capable of big things at the plate. During one two-week stretch last season he hit .558 with six extra-base hits and 19 RBI as he won back-to-back ODAC Player of the Week honors. For the season he batted .342 and had 23 extra-base hits. Second baseman Tristan Baker was second team All-ODAC and hit .351. Pitching depth and prowess may be a concern for the Hornets this season. Their top two pitchers graduated making it a must for younger players to elevate their game if the team is going to compete again nationally. They do return Robert Klinchock, who wore the same tie as teammate Chris Seymour in their individual pictures for the team website, but he’s been susceptible to giving up big innings. He started 13 games last season, totaling 65 innings and finishing with a 5.82 ERA. Michael Prosperi could develop into an important starter this season after excelling in a mixed role last year. He threw 40 innings and had a 1.80 ERA. Gerrard DePhillips and Reeves Lowry could also be a bit part of the teams’ success. They combined to start 11 games and together earned nine wins on the mound. UWW had another lopsided record, finishing the season with a .804 winning percentage; however the bulk of those wins occurred during the first half of the season. They finished the year going 8-4, a respectable mark, but still nothing in comparison to their results from March and April. The Warhawks did win their fifth Wisconsin Intercollegiate Athletic Conference regular season title in six years, but couldn’t pair it with a postseason tournament title as it was called off due to weather. In the NCAA Regionals, UWW won their first two games, including a victory over eventual national champion Texas-Tyler, but lost a game to Rhodes and a rematch with the Patriots to get eliminated. Senior slugger Cal Aldridge won a wealth of awards last season, being named a consensus first team All-American and the ABCA Midwest Region Player of the Year after batting .451 with 19 doubles and 15 home runs. His .882 slugging percentage led the WIAC and was third nationally. While not quite as prolific, Alex Doud wielded a monster bat as well. In 32 games he batted .438 with six home runs and finished in the top 20 in slugging percentage at .733. Catcher Mike Aiello gives the team experience behind the plate and Nick Santoro impressed in his first season on campus, batting .303 with 17 stolen bases while playing third base. Michael Kaska garnered third team All-American and Midwest Region Pitcher of the Year accolades last season after posting a 9-1 record with a 1.41 earned run average in 63 2/3 innings pitched. He held opponents to a .221 batting average and will once again anchor the staff. Aside from Kaska, the pitchers who are returning are relatively young and inexperienced, but full of potential. Matt O’Sullivan, Riley Gruetzmacher and Westin Muir accumulated 93 strikeouts in 87 innings between them as freshman. O’Sullivan was the most individually impressive of the bunch, seeing action in 18 games and throwing 39 1/3 innings while only allowing 25 hits. Perennial Power Cortland St compiled another memorable season last year, earning 35 wins and nearly reaching the D-III CWS for the fourth time in five seasons. However they let a late lead slip in an elimination game against Southern Maine in regionals to have their season come to a close. This season head coach Joe Brown and his staff believe that they could have the strongest group of arms they’ve ever had on campus. They will be battle-tested for the postseason after playing a grueling schedule which features games against Trinity, Salisbury, LaRoche and several other quality clubs. While it is the pithing that is getting the preseason heat, the offense isn’t too shabby either. Colin BeVard hit .306 last season and stole 12 bases. Antonio Pragana batted .355 and Marcos Perivolaris batted .337. They’ll be joined by Scott Giordano, who was the Most Valuable Player of the 2018 Mid-Hudson Conference while playing for Westchester Community College last season. He batted .425 with 20 stolen bases and seven home runs for the Vikings. The starting rotation is relatively inexperienced in their roles, but have impressed immensely out of the bullpen. Isiah Hudson threw 48 1/3 innings last season, striking out 42 with only 10 walks and 42 hits allowed. His season ERA was 2.42 and final record was 7-1. Steven Salisbury threw 28 2/3 quality innings and finished with a 1.57 ERA. Much is also expected of Matt Valin in an expanded role this spring. He had a 3.43 ERA with 34 strikeouts in only 21 innings last season. New to the staff will be former Sienna pitcher Zac Durant. He was one of the top starters in the Perfect Game Collegiate Baseball League over the summer, throwing strikes for the Amsterdam Mohawks. The Garnet were a surprising success last season, completing the school’s best season in program history by capturing the Centennial Conference Championship, sweeping their way through the NCAA Regional Tournament with wins over traditional powers Cortland and Southern Maine and even winning a game at the D-III College World Series. It was an incredible turnaround for a team that finished six games under .500 (16-22) just the season before. Per the NCAA’s metric, it was the second-best return of fortune since they began tracking improvement in programs 20 years ago. All indications are that last season’s results will not a one-time glitch in the matrix. With the overwhelming bulk of last year’s team back in action, the best could be yet to come. Almost every player who had an at bat season for a team that hit a collective .312 will be back for another deep postseason run. That includes four players that broke the century mark in total bases. The most accomplished hitter back in the lineup is Jackson Roberts. He hit .399 with 17 doubles and led the team in home runs. Charles Levitt and Cole Becker were nearly as formidable, batting a combined .353 with 16 home runs and 106 RBI. Yet another welcome addition returning to the lineup is Jared Gillen who managed a respectable .288 average and added 21 doubles and 15 stolen bases. Just as with the offense, the gang is almost entirely back on the mound as well. Ricky Conti and Sawyer Lake give head coach Matt Midkiff a formable pair to start the rotation. Conti threw 93 1/3 innings, a pair of complete games and only allowed 74 hits as he generated as 12-3 record and 2.60 ERA on the season. Lake nearly struck out a batter an inning, K’ing 67 in 68 1/3, while finishing with a 3.42 ERA. Jack Corkery is one of five other pitchers back who appeared at least 10 times on the mound. He had eight saves, only allowed 19 hits in 31 1/3 innings and had a 2.01 ERA. The Captains finished the least year 35-12 and held a spot in the Perfect Game rankings for the entire season, finishing the year in the 10th position. Last May was a bit of a roller coaster for head coach John Harvell. After capturing a share of the program’s first-ever Capital Athletic Conference regular season title, CNU went 1-2 in the CAC tournament, twice getting upset by Penn State Harrisburg. Nevertheless, the Captains earned an at-large bid to the NCAA’s and earned the school’s first regional tournament victory since 2012 when they defeated Denison in the opening contest. CNU would win two more games, defeating TCNJ and LaGrange, but they couldn’t get past Randolph-Macon who ran away with the regional title after jumping out to a 6-0 lead in the title game. Much of the team that finished a game away from the final eight returns for what should be another memorable season. The CNU offense was among the nation’s best last year, ranking fourth nationally in home runs and sixth in total runs scored, thanks in large part to the contributions of Seth Woodard. Woodard, who reached base in all 47 games, led the team with a .386 average while slugging .705 and earning a lofty on-base percentage of .511. For those magnificent numbers he was bestowed the title of CAC Player of the Year. He’ll be back in the heart of the lineup looking to drive home leadoff hitter and center fielder Jordan Mason, who hit .312 with 20 stolen bases. Nicholas Baham, who hit .270 with 11 doubles and 10 home runs, and shortstop Nick DiNapoli, who batted .357, are other noteworthy CNU players who will be back on the diamond. The pitching staff is young, but talented and capable. Josh Husby and Gray Goodrich both impressed as freshman, each making nine starts in 11 appearances. Husby was particularly impressive earning a 2.76 ERA with 52 strikeouts in 49 innings. Brian Owens will be back to spearhead the bullpen. He threw in 30 games last season for a total of 50 innings in which he struck out 72 batters while only allowing 35 hits. Austin Slough was one of the top long relief options for the Captains. He threw 19 innings on the season and earned a 3.79 ERA, a number which dropped exponentially as he only allowed two earned runs in his final seven outings. The Cougars won their eighth straight Middle Atlantic Conference title as they outscored their conference mates 51-18 during the championships. With the wins they advanced to regional play where they needed five wins, including three in elimination games, to advance to the D-III CWS for the first time in school history. While in Appleton Misericordia won their first game against Randolph-Macon, but lost their next two to get sent home. Of the eight players from last season who get at least 100 at-bats only one isn’t returning to the diamond this spring. Consequently the offense should be a well-oiled machine from the first pitch. Seniors Steve Weisensee and Kenny Jarema will lead the offense. Weisensee led the team with a .348 batting average, 63 hits, five triples and 89 total bases. He was especially hot at the MAC Freedom Championships, going 13-for-22 with 13 runs batted in and nine runs scored in five games. Jarema made 51 starts at third base and set a school record with 49 walks that propelled his on-base percentage to .488. He also stole 18 bases and tied a program record with 60 runs. The top two starting pitchers return in Drake Koch and Ian McCole. Koch finished the season with a 7-1 record and a 3.28 ERA and was named NCAA Mid-Atlantic Regional Most Outstanding Player. He led the team in ERA at 3.28 and struck out 71 batters in 71 1/3 innings. McCole was brilliant as freshman, leading the team with eight wins, which included throwing six shutout innings to earn the win over Randolph-Macon at the CWS. Two other big contributors back on the mound are Tom Jacob, who started eight games and finished with a 3.65 ERA, and Kyle Melahn, who appeared in 28 games out of the bullpen and earned four wins and eight saves. Babson started the season ranked 19th in the Perfect Game rankings, and, aside from a small bump in the middle of the season, stayed in the Top 25 the duration of the season. The Beavers won their second consecutive NEWMAC regular season and tournament titles advanced deep into the NCAA tournament, finishing as a regional finalist for the second year in row. In regional play Babson beat Catholic, Union and Misericordia before falling twice to the Cougars. With 26 players back the Beavers should challenge once again to play well into May and advance to the D-III CWS. Almost the entire infield returns with the everyday shortstop, second baseman, catcher and first baseman returning to the lineup. Brian McHale, the shortstop, batted .339 with 15 doubles, five triples and five home runs. Connor Gill, the regular second baseman when he’s not pitching, batted .294. Sean Harrington, who started 38 games behind the plate, batted .313, and Matthew Valente batted .311 as the first baseman. It was a quite the breakout performance for Valente who only appeared in four games off the bench the previous season. On the mound Michael Genaro has put compiled one of college baseball’s most enigmatic and incredible stats. In 180 1/3 innings he has only issued 10 walks. Last season in 72 2/3 innings he only issued three free passes while striking out 58. His ERA was a steady 3.10. As mentioned previously, the Beavers everyday second baseman, Gill, is also a pitcher. He went 6-2 with a 3.31 ERA in 70 2/3 innings over 11 starts last season. Alex Luka gives head coach Matt Noone a third experienced starter. Last season Luke entered the rotation as a freshman and had a 3.48 ERA in eight appearances, which included seven starts. Max Tennenbaum, who made 20 appearances out of the bullpen last season, gives the team a senior presence in the bullpen. BW had a phenomenal 2018, ending the season with a program-record 33 wins as well as setting new standards for runs, home runs, stolen bases and opposing batter strikeouts. While compiling those numbers the Jackets won the Ohio Athletic Conference Championship for the first time since 1985, sent Westfield State and Salisbury home in regional play and nearly eliminated Cortland. While they did lose some very important seniors at season’s end, the Yellow Jackets have enough coming back to pencil them in for another extended postseason run. After only hitting .206 in 23 games in 2017, outfielder Dudley Taw put up some ridiculous numbers last season. He led the team with a .385 batting average, hit 16 doubles and 14 home runs. He also nabbed 22 bases. For his efforts he earned a slew of postseason awards included All-American, All Mideast Region and All-Ohio Athletic Conference honors. Rejoining him on the roster will be Alex Ledwick, who hit .331 on the year as a freshman shortstop, Jacob Bonner, who hit .303 with 15 extra-base hits, and Philip Wells, who batted .338. Sam Sustersic, who played in 18 games at D-I Morehead State last season, has joined the team as a junior transfer. The pitching staff has retained their ace from last season in Danny Cody. The 6-foot-3 senior made a school-record 14 starts among his 17 appearances, striking out 100 batters in 83 1/3 innings with a 3.13 ERA. Nick Smith, who started five games as a freshman and held opposition to a .206 batting average, will be back, as will three other important pitchers who held down the bullpen. Jack Raines, Michael Hubert and Spencer Berg accumulated 126 1/3 innings between them as each appeared in at least 15 games. Keystone, the 2016 national runner-up, finished last season with a 34-12 record. They won their 10th consecutive Colonial States Athletic Conference title, finishing the year with only a single loss to CSAC competition. In the NCAA regionals they alternated wins and losses, defeating Mitchell College and Western New England, but losing to Oswego State and Ramapo. Almost the entire starting lineup is back, but one player in the bunch stands out from the rest. Dakota McFadden is a physical behemoth and may be the most valuable of any player in D-III. Last season he started 12 games on the mound, striking out 83 in 85 innings and finished the season with a 2.75 ERA. When he wasn’t on the mound he was still a part of the heart of the Keystone lineup, playing outfield or DH for the Giants. He batted .349 with 15 doubles and six home runs. In addition to McFadden, the Giants also have Mohammed Hussein who was voted the CSAC Player of the Year after batting .386 with 16 doubles. Like McFadden, he also spent time on the mound (as well as almost every other position on defense). He made four starts and had a 2.05 ERA in his five appearances. Other notable returners on offense include Adam Kelly, who led the team in home runs, Johann Paniagua, who lead the Giants in stolen bases and played second base, and Ryan Callahan, who is solid behind the plate. The Giants will be without their best pitcher statistically from last season but still return a number of quality arms. Rejoining the aforementioned McFadden and Hussein on the staff will be Nathan Hinkley and Christopher Adams. Hinkley allowed two or fewer runs in eight of his 10 appearances last season, finishing with a 3.28 ERA in 57 2/3 innings of work. In the New England Regional against Western New England he threw a complete game and struck out nine. Adams started 10 games last season and finished the year with a 3.79 ERA. Transfer Zabdiel Parilla from Cecil College could make an immediate impact after throwing gas for the Seahawks. The Lakers started slow last season, spitting their first 10 games, but seemed to exponentially get better as the season progressed. In the State University of New York Athletic Conference Championships, the Lakers amazingly won three games on the final day (two of which were over Cortland) to win back-to-back tournament titles. They continued to roll in the regionals, sweeping their way to Wisconsin for the second year in a row by beating Suffolk, Keystone and UMass Boston twice by a total score of 36-11. They were cooled off in Appleton, however, losing both their games to have their season come to a quick end. Oswego State has been dominating the last two season thanks largely to some outstanding pitching performances by outgoing seniors. Nevertheless, a new wave of talent is right behind which should continue their winning ways. The Lakers offering will be led by Mike Dellicarri who led the conference in runs, RBI (he once had seven in a game) and home runs and finished second in the SUNYAC with a .608 slugging percentage. Ryan Enos was a pleasant surprise as a freshman, batting .345 while leading the conference is doubles with 14. Brandon Nicholson led the team with 17 stolen bases, added six home runs and held down the defense at second base. He’ll be back along with catcher Lukas Olsson, who caught 11 potential basestealers and batted .274 with 10 extra-base hits. While their top two pitchers from last season graduated, the Lakers have another trio of upperclassman ready to make their mark. Brian Nolan is the heir apparent to the ace status after earning a 7-2 record and 2.98 ERA in 10 starts last season. Matt Bowman and Nick Demarco are the other two seniors who will lead the team. Bowman didn’t allow a single earned run in his first six innings to start his Laker career and finished with a 3.08 ERA. Demarco struck out 24 batters in 24 1/3 innings and had a 2.96 ERA. Kieran Finnegan had a sensational season as a senior in high school and could have played at a higher level division but choose to play at Oswego. He’ll join the staff this spring. The Chapman Panthers make their Perfect Game rankings debut at the No. 18 position to start the 2019 season. Last season the Panthers won their first Southern California Intercollegiate Athletic Conference tournament title in school history after coming back from a 10-1 deficit to defeat Redlands 20-12. With the win Chapman advanced to NCAA regional play for the first time since 2011. There they earned another postseason win over Redlands, but dropped games to both Willamette and Texas-Dallas to have their season come to an end. Head coach Scott Laverty returns much of last year’s roster in what could be another breakout season for the Panthers. Offensively Tristan Kevitch’s .382 batting average, seven home runs and 12 doubles each led the team. Rejoining him in the outfield will be Alex Tsuruda who hit .364 after starting his college career at Brigham Young. Jarod Penniman and Aaron Wong give the team stability and experience up the middle. Penniman was the everyday shortstop and batted .343 while Wong’s primary position was second base. The two of them only committed 15 total errors in nearly 90 starts between them. The pitching staff returns their top starter from last season, Tyler Peck. Peck started 13 games and had a 2.63 ERA with 98 strikeouts. He threw two complete games as well as the first 7 1/3 innings of what would become the Panthers’ first no-hitter since 1973. Aside from Peck there are no other experienced starters on the staff. However, there are multiple arms that could take over the roles after throwing impressively in a relief role. One of the pitchers is Johnathan Hernandez who appeared in 17 games, totaling 48 2/3 innings. During his time on the hill he struck out 40 batters while only allowing 10 walks and finished the season with a 3.14 ERA. Cody Turner was brilliant out of the bullpen as a freshman. He appeared in 16 games, earned four saves and allowed just four runs in 20 1/3 innings pitched for a 1.77 ERA. After finishing 2016 and 2017 with good-but-not-great records, the Lynx returned to compete with the elite as they completed a historic season with a record 15-6 conference record, a 5-1 finish in the SAA Tournament and advanced deep in the NCAA Regionals where they fell one win shy of reaching the D-III World Series. Thirsty for more success in 2019, Rhodes returns most of their position players and pitchers and will once again challenge for a position to be among the final eight. The top four hitters return and each of them are deadly in the batter’s box. Paul Giacomazzi led the team in batting, finishing the year at .366 with 12 stolen bases. He also was the youngest player to earn ABCA/Rawlings Gold Glove Awards in back-to-back years. Jacob Telli, the club’s catcher, completed the season at .364 with 17 doubles and 19 stolen bases. Nick Bosma and Will Heurtin didn’t have the same lofty batting averages, but what they give away in average they make up for in power at the plate. Bosma led the team with eight homers and Heurtin had 20 extra-base hits and hit .302 as a freshman shortstop. Back on the mound will be Trey Sledge who was arguably the team’s top starting pitcher last season, starting 15 games and totaling 86 1/3 innings with a 3.96 ERA. Jacob Dubs gives head coach Jeff Cleanthes an additional experienced quality arm after making six starts in seven appearances as a sophomore. The before-mentioned Bosma, who led the team in home runs, was also the Lynx’ most important arm out of the bullpen. He made 26 appearances on the mound, leading the team in ERA at 2.89 and earned a D-III leading 16 saves, which also placed him in a tie for third for the all-time record. Willamette started last season in the Perfect Game D-III Top 25, but quickly fell out after an unimpressive start to the season losing 11 of their first 20 games. Consequently, it looked like a pick gone awry, However WU had a second half surge, winning 11 of 12 games and earned their first appearance in the NCAA D-III tournament after capturing the Northwest Conference Baseball Tournament title. In regional play the Bearcats performed well, winning three of five against top competition. They suffered both their losses at the hands of national runner-up Texas Lutheran to have their season come to a close. This year the Bearcats should be just a forcible as they were the post the ides of March last spring. They return many of the players both at the plate and on the mound and will unquestionably be one of D-III’s best team in the west. Connor Bailey started all 50 games last season and finished second on the team with a .339 batting average while leading the Bearcats with 55 RBI and 15 home runs. Shortstop Tyler Janitz batted .313 and provided impenetrable steel slate defense. Brendan Natuzzi will rejoin him on the left side of the infield as the team’s regular third baseman. He hit .280 with 11 doubles and nine stolen bases. Catcher Cole Pursell was only able to play in seven games last season, but should contend for postseason honors after batting .298 as a sophomore. Joey Faudskar is in line for breakout season after seeing limited action his first two seasons. In the New York Collegiate Baseball League he was second on his team in hitting at .364 and plays excellent defense. Pitching-wise, Willamette can dominate. Matt Steindorf had an 11-3 record last season, earning a team-leading 2.87 ERA in 109 2/3 innings. Brandon Nelson and Benjamin Whitten, who combined to start 23 games last year, are also back on the roster. Brandon Murillo led all relievers with a 1.88 ERA and earned seven saves as a freshman. Natuzzi and Faudskar, who were listed among the returning offensive threats, also spent time on the mound. Natuzzi appeared in six games, including two starts, and struck out 14 in 15 1/3 innings. Faudskar earned four saves and struck out 12 in 12 innings over eight appearances. After wining a combined 70 games in 2016 and 2017, last season was a disappointment for the Cardinals, especially after starting the season an admirable 24-9. They stumbled their way to the finish line, going a distressing 5-7 to close the season. However, even in that downtrodden stretch there was still some spark of the team that started the season ranked 11th in the nation. The earned a win over Keystone College, two over Ithaca and rolled over Stevens, who was the top seed in the Empire 8 Championship. In an effort to erase last year’s shortcomings the team returns a deep-balanced lineup that features a lot of experience from top to bottom. That, combined with a strong bullpen and a trio of front-line starters, should make them a formidable team. The offense will be without Scott Eisenmenger who tied the program record for career hits, but much of the rest return, capped by a quartet of juniors who should make the Cardinals a team to beat in the Empire 8 the next two seasons. Justin Graham and Thomas Pasquale batted a combined .346 with 26 doubles between them. Graham also served as the team’s leadoff hitter and shortstop while Pasquale positioned himself next door at third base. Ryan Simmons and Allen Murphy are the returning power threats on the team. They combined to hit 13 home runs and batted .307 and .324, respectively. Simmons was also an invaluable asset on defense playing second base. Murphy has been getting some looks from local scouts as a potential professional product. Jack Kelleher, who hit .606 at a senior and led his school to a title, will give the lineup some extra oomph. The Cardinals’ pitching staff doesn’t have staggering stuff, but they do manage to get outs and win games. Anthony Brophy was the team’s top pitcher last season and will be back on the mound once again. He led the team with a 2.99 ERA and 69 1/3 innings pitched. He topped all his Empire 8 brethren with four complete games. Tim Geissel and Kyle Chambers give head coach Brandon Potter some needed experience on the staff. Geissel was able to hold his own as a freshman, starting eight games and finishing with a 4.81 ERA, while Chambers struck out over a batter per inning in a mixed role and even threw a shutout. Lefty Dillan Wilkinson earned Empire 8 First Team honors for his work out of the bullpen. He appeared in 16 games earning a 3.38 ERA. With a sweep of Salve Regina, Western New England earned their first Commonwealth Coast Conference title since 2012. They went on to play admirably in the regionals, however, they were out-slugged by Rampo 19-15 in the opener and Keystone came from behind to eliminate them in their third game. Head coach Dan Gomez brings back a loaded roster in 2019, which could be a monumental year for the Golden Bears. The speedy offense touts the reigning CCC Player of the Year in senior shortstop Alex Loparco. Last season his batting average jumped nearly 100 points as he finished the year at .382 with 15 extra-base hits and 19 stolen bases. He also had a solid summer playing with the Bristol Blues of the Futures Collegiate Baseball League where he tied for the team lead in home runs. Other impact players back in Springfield include the outfield of Joe Cassella who hit .372 with 22 stolen bases, Erik Lacaire, who hit .290, and Ben LaCroix, who finished the season at an even .300. First baseman Zac Nussbaum, who hit six home runs last season (twice as many as anyone else on the roster), will also be back in the lineup. WNE also returns the 2018 CCC Pitcher of the Year in senior southpaw Bob Hamel. Hamel went 7-0 with a Division III-leading 0.95 ERA, threw four complete games and struck out 53 batters in 57 innings while only allowing 46 hits and 16 walks. Paul Wetmore gives the team as second dependable, apt starter. Last season he led the team in total innings pitched at 58 2/3 in which he struck out 60 batters. He threw three complete games (two of which were shutouts) and finished with a 3.99 ERA. Sean Halligan is as steady as they come out of the bullpen. He appeared in 12 games last season and will be the closer this year. He only allowed a pair of earned runs in 22 1/3 innings last season to finish with a 0.81 ERA. The Gorlocks’ 2018 campaign included a 21-game winning streak, a 12th consecutive St. Louis Intercollegiate Athletic Conference championship, the SLIAC tournament title and an impressive showing in the NCAA Regionals where they went 2-2 with wins over Thomas More and Monmouth. They finished with a record-breaking 38 wins after getting eliminated at the hands of eventual national champion Texas-Tyler. While there are some major holes in the roster left by graduating seniors, there is a plethora of players coming back for what should be another memorable season. Kyler Kent hit an astonishing .428 last season with 17 doubles and led the team with 28 multi-hit games. His 83 hits set a new school record. Ben Swords and Joe Swanson are other important contributors headed back to school. Swords hit .360 with 19 doubles and successfully stole 18 bases. Swanson handled the top-shelf pitching staff as the everyday catcher and hit .276. The team’s leader in stolen bases, Adam Lowell, also returns. He batted .312 in part-time action. Even with all that offense returning, Webster’s pitching prowess may be even better. Matt Mulhearn went 10-2 with a 2.99 ERA and struck out 76 batters in 84 1/3 innings while only issuing 14 walks. Sean Beaver also dominated as a starter, finishing with a 2.14 ERA and two complete games as a freshman. Shane Donovan excelled in the bullpen and will return as the closer. He appeared in 25 games last season and had six wins and eight saves. The Panthers program is one of only a dozen D-III schools to break the century mark in wins in the last three years. Last season they swept to their second straight USA South Tournament title and advanced to play in the NCAA Regionals where they eliminated Alvernia and TCNJ before getting eliminated. The Panthers have a young team which could be an extremely dangerous club to face as the players continue to grow and develop. Jacob Gassert, one of the few seniors on the team, was the top hitter last season, finishing the year at .338 with five triples and four home runs. He’ll be rejoined by Jack Layrisson who was named the USA South Rookie of the Year after batting .337, hitting four home runs and led LC with a .571 slugging percentage. McKinley Erves also impressed as a freshman, batting .331. Dawson Weaver gives head coach David Kelton infield stablity with his continued presence at second base. He finished the year batting .325. The Panthers return three pitchers who threw over 55 innings last season. Two of them, Austin Fain and Richie Post, were accomplished starters for LC. Fain had a 3.42 ERA and has amassed a 10-3 record his first two seasons since transferring from Lurleen B. Wallace CC. Post had a 2.95 ERA and struck out 53 batters in 61 innings, improving on his USA South Rookie Pitcher of the Year honor from the season before. Gibson Bittner was phenomenal out of the bullpen. He appeared in 23 games, earning a 6-2 record and conference-leading 1.45 ERA, which was in the top 20 nationally. In the USA South Tournament he appeared in three games, totaling 10 innings, and didn’t allow a single run to score. The Spartans put together a quality season last spring but didn’t receive an invitation to play in the NCAA Regionals despite finishing with a 29-10 record, which included wins over Cortland, Washington & Jefferson and Emory. This season CWRU will be looking to take the decision out of the committee’s hands by giving them no choice but to let them in with an impeccable résumé chock full of wins and lopsided boxscores. With a number of seasoned starters back and a deep pitching staff, that shouldn’t be much of a problem. Second baseman Rocco Maue is the team’s leading offensive and defensive performer and was named the University Athletic Association Most Valuable Player after finishing the season with a .358 batting average, a school-record 11 home runs and 26 stolen bases. He’ll be rejoined in the lineup by shortstop Jacob Lott, who batted .287, and catcher Tyler Wypiszenski, who hit four home runs and five triples and thew out 15 of 29 would-be basestealers. Jacob Kucia’s batting average took a dip from the .290 average he posted in 2017 but he still played stellar defense at third base, committing only five errors on the year. There are three starting pitchers back who were solid last season. Mark Gross returns to be the team’s top pitcher. He threw 70 2/3 innings last season, finished with a 3.69 ERA and held opposition to a .248 batting average. Matt Levine will rejoin him in the rotation after finishing with a 6-1 record and 3.18 ERA as a freshman. Casey McConihe made nine starts, totaling 38 2/3 innings and held opposing hitters overall to a .227 batting average. He also played first base for the Spartans, batting .274 in 62 at-bats. Corey Brown gives the team experience out of the bullpen. He made a dozen appearances and totaled 39 1/3 innings and only allowed 24 hits while striking out 31 batters.